Striking semi-manuscript school-girl map of the British Isles. 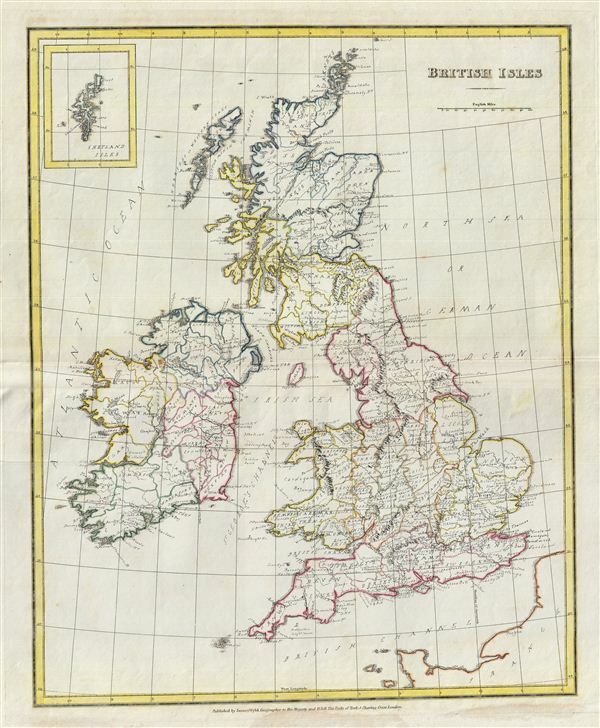 An unusual and beautiful 1823 semi-manuscript map of the england, Wales, Scotland and Ireland, with an inset map of the Shetland Islands in the upper left quadrant. The printed portions of this map follow the cartography of James Wyld and include the basic outlines of counties and provinces in color. The remainder of the map, including all textual labels and color work, had been completed in manuscript, that is to say, hand drawn. Wyld most likely produced this map intentionally without labels for use as a classroom workbook by which children could learn geography by filling in the blanks. The manuscript geographical data and detail throughout is altogether outstanding. The work is completed in a fine hand adept at decorative text and the rendering of rivers and mountains. The geography follows the conventions of the period though is exceptionally detailed throughout, reflecting no doubt the manuscript cartographer's origins and familiarity with the British Isles.